October 6th was the 50th anniversary of the debut of Breakfast at Tiffany’s. Arguably, one the most famous stray cats in the annals of American culture is Audrey Hepburn’s poor slob without a name, a principle actor in the film. 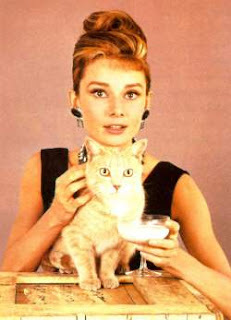 The role, portrayed by Orangey, a two time winner of the Patsy Award (Picture Animal Top Star of the Year), is that of a stray cat living on the streets of Manhattan** In the film, this homeless cat quickly becomes a metaphor for the rootless life led by the charming and eccentric Holly Golightly (Audrey Hepburn) who befriends him. Not to give the story away for anyone who has not seen this 1960’s classic, but the final scene in the film with Holly, Paul—the man who is in love with her, and cat is worth at least two fistfuls of tissue. Orangey, a red tabby, made his film debut in 1951, as Rhubarb in the film of the same name. His acting career spanned fifteen years, including the role of Minerva in the television series, Our Miss Brooks. **As with most films involving animals, Orangey had several feline, on-set stand-ins during his career.